Whale Watching in Maui: Tips to Make it Unforgettable! Whale watching in Maui is one of those things that animal lovers won't want to miss out on. For us, seeing whales out in the wild where they belong was a truly unforgettable experience and one of our favourite things to do on Maui! Here are a few of my favourite tips and other information to help you get going on planning YOUR Maui whale watch and make it truly unforgettable! This one will come as no surprise, but I think that the best way to see whales is to go Maui whale watching by boat! It's my favourite way to whale watch because you can get so much closer to the whales compared to staying on land! As you can see, sometimes folks on Maui whale watching tours get closer to the whales than they ever thought possible! Now THAT must surely have been unforgettable! Did you know that in the state of Hawaii, boats must not approach within 100 yards of a whale? Interestingly, it is illegal to approach within 100 yards of a whale by any means - even swimming! So just how can you legally get a close encounter with a whale then? Well, if a whale comes within 100 yards of a boat, the vessel must stay put until the whale departs. If you ask me, being forced to stay put while a whale checks out your boat is not a bad deal at all! 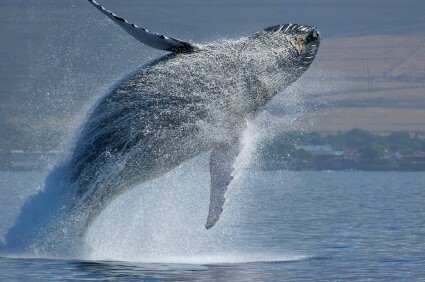 How can the boat captains increase your odds of one of these close encounters when whale watching in Maui? A lot of them try to get close to the whales by anticipating where the whales are headed. Then they wait there, hoping the whales will come over for a visit. 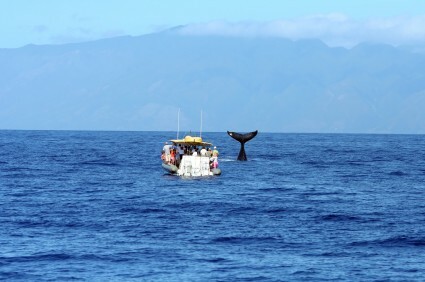 If you don't have the budget for one of the Maui whale watching tours, then don't despair! Another option is to go Maui whale watching from shore for free! To get a close up view of the whales, I recommend you bring along a good pair of binoculars so you can zoom in and get that coveted close up view of these amazing creatures! Although you can go whale watching in Maui from pretty much anywhere along Maui's shorelines, the south and west sides of the island are the most popular. Makena Beach Park - many people in search of even better views will climb the cinder cone known as Pu'u Ola'i. This cinder cone is located behind Little Beach. Alternatively, you can just climb the rocky dried lava flow that lies between Little and Big Beach, or, watch for whales from the beach itself. Why not save some money by combining your whale watch with some other activity? This is what we did on our last Maui vacation! In our case, we were able to whale watch on our boat ride back to Maui after our daytrip to the island of Lanai (this was in early December)! You are unlikely to see as many whales as you would on a tour specifically devoted to Maui whale watching, but if you're looking to save some money by combining activities, this is a great way to do it! Other options for whale watching in Maui include watching for whales while on a snorkel trip, or combining a Maui whale watch with a sunset cruise! If you do this, I recommend that you book this activity for early on during your Maui vacation. Best case scenario: you see lots of whales and end up saving money by combining activities. Worst case: You don't see any whales, but you can always book another trip specifically for whale watching in Maui later in your stay! If you want to go Maui whale watching, then plan your Maui, Hi vacation for sometime between December and early May. However, the "peak" of the whale season is actually January through April. Baby whales, known as calves, are usually born sometime after late January - if you want to see THOSE, then plan your trip accordingly! No one particular time of day is better than another for spotting whales - what time of day you choose to go Maui whale watching depends solely on your personal preferences. If you book a tour with a company that has hydrophones, you'll be able to hear the male whales singing underwater! The Pacific Whale Foundation is one such company. Especially if you plan on Maui whale watching from an unshaded location, I suggest you plan to avoid going in the morning or late afternoon. The sun can get pretty hot in the afternoons, so your Maui whale watching experience will probably be more comfortable if you stick to the cooler times of day! Bring along a good pair of binoculars. This will enable you to get great close-up views of those whales! Keep an eye out for the tall plumes of vapour that whales expel through their blowholes at the water's surface - if you see this, keep a close eye on the area - if you're lucky, the whale will rise out of the water to give you a great view! If you're interested in going whale watching in Maui, you can get more information on available tours, rates, and bookings on the Barefoot Tours site. (Link will open in new window.) When you get to their site, just go to the left side of the screen under "Maui," then choose "Whale Watching Tours on Maui" from the drop-down menu for their complete listing of tours, descriptions, and pricing. Why do I recommend that you take a look at Barefoot Tours? Click here to find out! Having trouble deciding which tour to choose? Check out my TOP PICKS for whale watching tours in Maui! 1) To see some of our whale and dolphin pics from our Lanai daytrip, scroll down about halfway through "Our Dolphin and Snorkeling Adventure on the Island of Lanai." 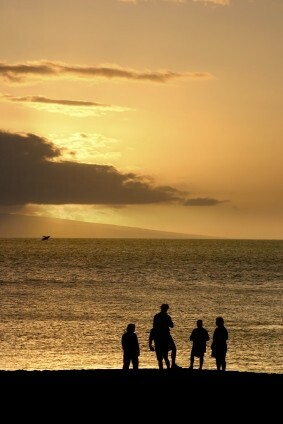 2) Looking for more great things to do on Maui to relax? Click here for our our top things to do on Maui for relaxation!